18 total workouts - Over 3 Hours Per DVD! Cycling Fitness Results is a functional back-to-basics workout series with proper warm-up and cool-down periods, and cycling specific stretching exercises. 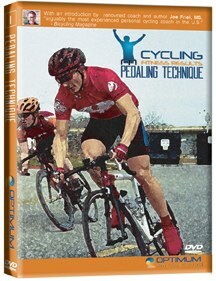 Each DVD contains 3 progressively more difficult workouts...over 21 hours of training! These workouts were developed to teach proper pedaling mechanics. Learn how to spin the pedals with suppleness and efficiently apply power. Develop efficient pedaling techniques. Ride faster and further without depleting your energy reserves! These workouts will develop cycling specific strength. Transfer strength gained during weight training to actual pedaling strength on the road. These workouts produce high tension in fast twitch muscle fibers. Lead the pack up long sustained climbs! These workouts will increase your VO2 Max capacity. VO2 Max is the maximum amount of oxygen delivered to the muscle and is a measurement of a strong cyclist. The VO2 Max Intervals increase the oxygen supply to muscles. Bridge gaps and cover attacks with ease! These workouts will increase your Lactate Threshold. Once lactic acid accumulates in the muscles, fatigue sets in, and you are forced to slow down. Training with Lactate Threshold Intervals teaches the body to tolerate lactic acid and increase speed at this level. Set your personal record in a time trial or simply stay with the lead group off the front of the pack! These high power workouts will assist in the tolerance and buffering of lactic acid and utilizes it as an additional source of energy. Attack the pack and power away to the finish line! These workouts will improve your ability to adapt to changes in intensity during long climbs. These workouts assist in developing and clearing lactate while under high resistance such as climbing. Attack and recovery on climbs!